The roughest path of the world is perhaps on a safari tour, which preserves the primitive wilderness in its natural state. On a safari tour, where countless wild animals have their own set of rules in life, the experience is all the more interesting as we cannot encounter something like this very often. NEXEN TIRE introduces you to a car safari tour where you can enjoy vivid wildlife off the road. 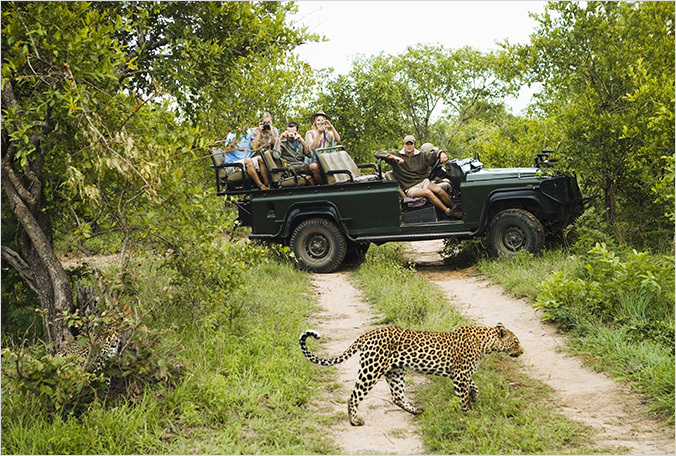 Kruger National Park in South Africa offers a drive-through safari program in a four-wheel-drive car. Of course, you will be accompanied by a professional guide who has extensive knowledge about safari tours as well as a ranger that will protect your safety in case of accidents or danger, leaving you without any worries. The Big Five game of finding the five famous animals in Africa (elephants, lions, leopards, rhinoceros, and buffalo) with the rangers is the most prestigious game of the safari tour here. You will receive a certificate for finding all of them. The safari tour at Kruger National Park begins twice a day before dawn, since that is the best time for when you can encounter diverse animals in the wild. Visitors mostly enjoy the safari tour along with camping for four or five days. The wild animals trudging along the grassy plains of Africa at sunset is an unforgettable and magnificent sight. The Ngorongoro Conservation Area of Tanzania, which is situated in the very heart of Africa, is located to the south of Serengeti National Park. It is a prairie created by volcanic activity and is one of the biggest and best preserved craters on earth, located 2,300m above sea level with an area of approximately 259㎢. The extremely steep outskirts of the crater require visitors to ride four-wheel-drive cars. Animals are so familiar with vehicles that they tend to approach people closer than other safari tours in Africa. This place is also famous for its white rhinoceros, which are not easily found in other parts of Africa. 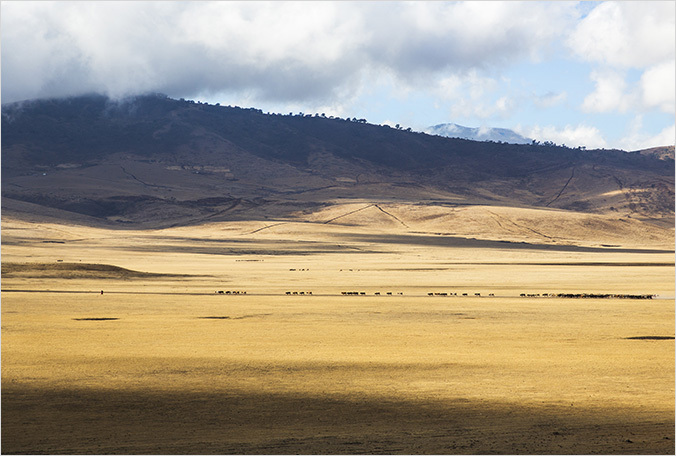 In the dry season of the Ngorongoro Conservation Area (June?September), you can see many animals gathering around waterholes. You will find yourself holding your breath as you watch in awe over the marvelous sight of carnivores and herbivores gathered in one place to drink water. Maasai Mara National Reserve, which is a major reserve in Kenya, is the home of the nomadic Maasai people and a game park. With an area of 1,500㎢, which is 2.5 times the size of Seoul, visitors can experience many things about wildlife. A veteran guide will lead tourists through the safari tour while keeping an eye on their physical fitness and mental state. This place offers endless pleasures with wild animals you can enjoy spotting, as well as the horizons off in the distance. 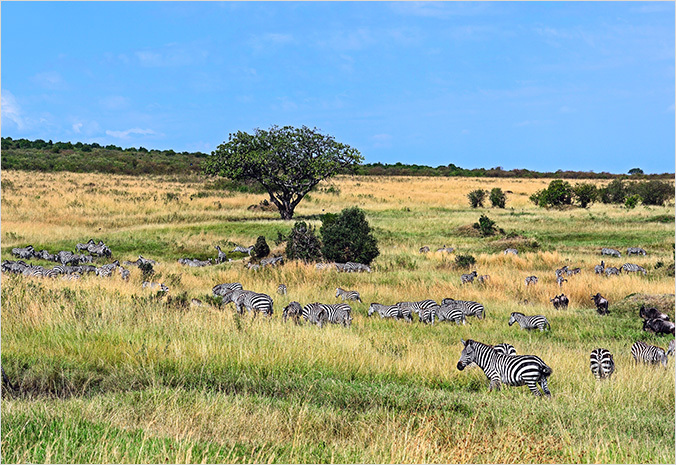 In September, 2 million gnus and 500,000 zebras were gathered here, since this place is the outpost for the great migration to Serengeti National Park across the Mara River. This is also one of the most magnificent sights that will keep you snapping pictures. The romantic camping site amid the starlight is also a must-try experience along with the safari tour. You can check out the traditional performances and houses of the Maasai people as well. Recently, the first camp was established in the national park to help the natives living in the special landscape and wilderness of Kenya. Visitors are provided with various tour programs and accommodations for their trip, such as trekking and observing wild animals. A safari tour allows you to fully enjoy the fundamental beauty of the wild! From safari riding that begins during the mystery of dawn to camping where you can see the night sky filled with stars, the safari tour is now waiting for you. Enjoy an overwhelming and heart-throbbing experience offered by pristine nature! : Let’s imbibe on the great taste! on a romantic trip this fall!